Summer may be coming to an end, but that doesn't mean the festivities are over quite yet! Labor Day is just around the corner—meaning a day off from work (rejoice!) filled with backyard BBQs, beach soirées, and pool parties galore. While you may already know what you're bringing to the event on your list (hello, apple pie), have you given your Labor Day outfit a thought? Well, if you need some inspiration on what to wear when Monday rolls around, we rounded up seven super-easy Labor Day outfits, courtesy of some of our favorite fashion stars. Keep reading to scope simple ensembles you can totally re-create using items already in your closet—and shop the available items too. On Aimee Song: Oliver Peoples Rockmore Light Yellow Aviator Sunglasses ($415); Chloé top; Rachel Comey Legion Pant in Dirty White ($345); Find Kapoor bag; By Far Iris Suede Pink ($425). On Julie Sariñana: Faithfull the Brand dress; Isabel Marant loafers. Camila Coelho: Roberi & Fraud Betty White Sunglasses ($175); Gucci Sylvie Leather Mini Bag ($2250); Self-Portrait Pink Lexi Trouser ($309); Dior shoes. On Chriselle Lim: Janessa Leone Bernt Hat ($237); Eberjey top; Carolina Santo Domingo Amphora Leather Top Handle Bag ($825). 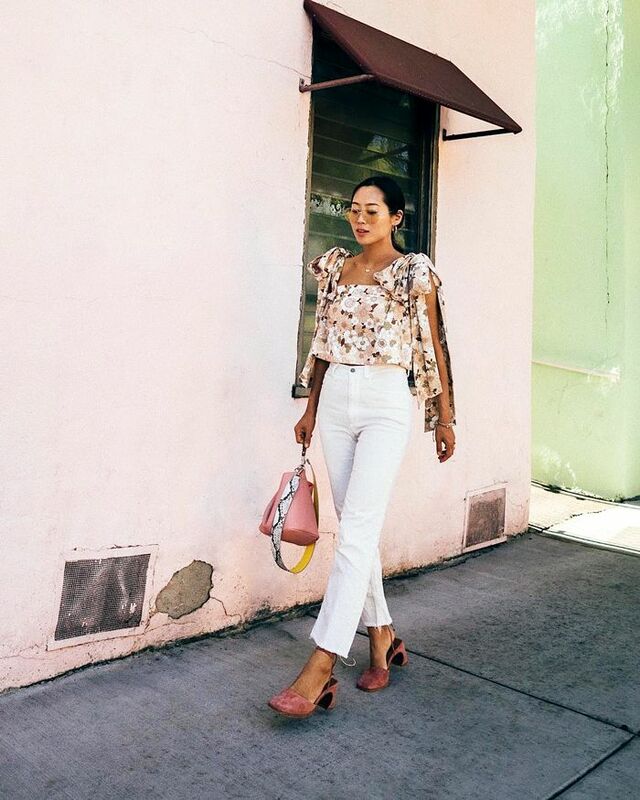 On Sara Escudero: Faithfull the Brand top and pants; Nomadic State of Mind sandals. On Kellie Brown: JCPenney top. On Reese Blutstein: Gucci Cat Eye Sunglasses ($415); Reformation dress; Superga Cotu Sneakers ($65). Next up, check out the cute top our editors can't stop wearing!